A sloping lot can add character to your home and yard, but these lots can be challenging when building. One way to make the most out of the slope of your chosen lot is to select a house plan with a walkout basement. Walkout basement house plans are the ideal sloping lot house plans, providing additional living space in a finished basement that opens to the backyard. Donald A. Gardner Architects has created a variety of hillside walkout house plans that are great for sloping lots. Whether you have a lot with a view or just want the extra square footage of a basement, we have the home plans to fit your needs. If you are purchasing a hillside lot, maximize your space with house plans for sloping lots. 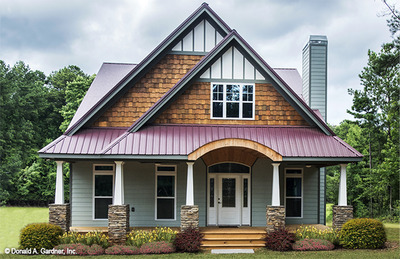 These home plans will ensure you get the most possible square footage of usable space in your home, providing all the benefits of a walkout basement. Donald A. Gardner Architects has home plans designed for most lot sizes that offer a walkout basement. We have daylight basement house plans in a wide range of architectural styles, including country cottages, modern designs, multi-story properties and even ranch-style homes. The Butler Ridge house design is a perfect example of our hillside house plans. It has 2,896 heated square feet with four bedrooms and four bathrooms, which is great for a primary family home or a vacation retreat. Another, yet smaller house design, is The Silvergate home plan. It has 2,401 heated square feet, but still has four bedrooms and four baths. Take the time to browse our walkout basement house plans today, and find exactly what you are looking for with the help of Donald A. Gardner Architects. Use our advanced search options to find exactly what you need based on square footage, number of bedrooms and more. If you do not see a plan you love that already has a walkout basement floor plan, then consider our modification services. Click here to learn how we can change a plan so it has the walkout basement exactly like you want.